Dutch troupe Chain of Dogs apparently decided that they have toiled in the underground long enough, self-releasing demos and EPs, supporting more well-known acts across the European continent and at metal festivals close to home and away. Time to compile all of that material and let the world go folk thrashing on the Witches Brew label releasing the compilation titled Burning Bridges in the World of Death – De Ep’s en nog get miee. A fitting title, perhaps, since this release combines their earlier Bridgeburners and Deathworld EPs, along with the tracks from the self-titled demo and the remix of a song from their only other full-length from a couple of years ago. Enough history, however, as Chain of Dogs themselves would hardly dwell on the past, judging how quickly they jump into action with D’r Zjwarte Hond va Krapoel after an accordion introduction. That accordion and some faster, rawer tracks (Ich Bring der Doeed, ‘t Zjwatte Loak), as well as prominent violin (Doa is mie Land) will certainly conjure comparisons to Korpiklaani, yet Chain of Dogs is not a clone of Finnish forest dwelling people. Sure they can include some polka rhythms on top of their guitars background (D’r Zjwarte Hond va Krapoel) and push the pace using double bass until everything dissolves into semi-drunken chorus and the crowd rousing mid-section (‘t Zjwatte Loak). Yet, Chain of Dogs melodies are squarely of Teutonic/Flemish origin, and rather than to come from the forest, theirs originate at a crowded medieval European marketplace, when one moment things are joyful and then we have soldiers marching off to war (Deathworld, Doa is mie Land). To create this atmosphere Chain of Dogs can switch on a dime going from ripping thrash to mandolin (Ich Bring der Doeed), replacing string tremolo guided raucous with power chords (Deathworld) or plunging the heroic epic melody into raw D-beating thrash (Blood Follows). Although not immune to repetition, just like many other folk driven acts, Chain of Dogs don’t sit still and move from narrative folk rocking to savagery with ease (Bridgeburners). To add further to the atmosphere of the traveling minstrels/vagants Chain of Dogs vocals is almost always gangstyle, even mixing a female voice, and closing a capello in Ich Bring der Doeed. That traveling medieval musician theme, but where violin and flute replaced bagpipes, strongly unites Chain of Dogs with In Extremo, the act the Dutch drew the most resemblance to in my mind. Unlike In Extremo, string pickings at the end of Deathworld show that Chain of Dogs take themselves a little less seriously, and their earlier works (The Foggy Dew, Tooth and Jaw) hint of punky hooliganism, even if they come with a pang of sadness (The Foggy Dew). From those early demos to most recent EP Chain of Dogs production cleaned up tremendously, and they are almost going too clean for their style of music in my opinion. 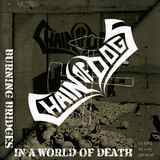 Overall a very quality, balanced effort, Chain of Dogs is a surprise discovery, and the fans of boisterous, unruly folk and thrash, i.e. the Korpiklaani, In Extremo and Skyclad aficionados, will do very well to seek these Dutch out.